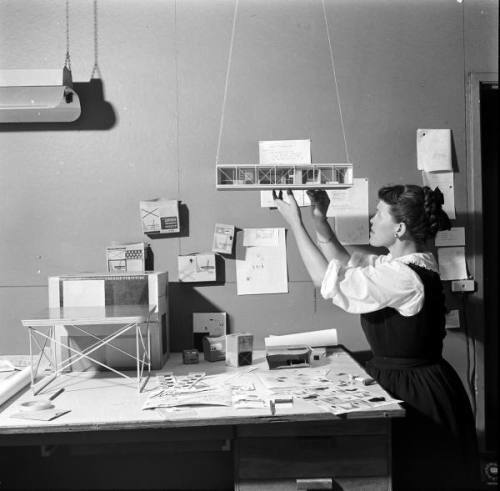 As a jewellery design student in Cape Town (a long time ago), my favourite book in the very cool Technikon library was a very big and heavy one about the work and lives of Charles and Ray Eames. Quite an old book, well thumbed and read by many. I can't even tell you how many times I borrowed the book from the library, only to go back to renew it for another week or two. Think I must have booked it out for a couple of months at least. I fell in love with the designs of this formidable duo and I was particularly fascinated by the quirky, tiny, pinafore-wearing Mrs Eames. She was such an odd little thing in a time when women either stayed at home with babies or worked as secretaries.